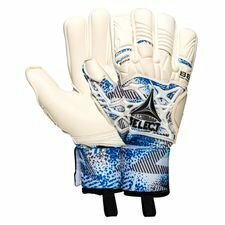 Select is back with a new glove. The 88 Pro Grip is a new glove made with a different look, which makes it ready for the modern game. 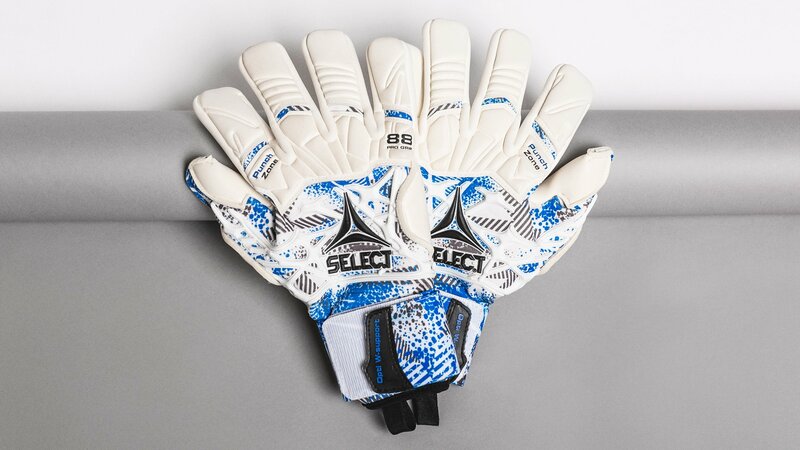 The Select 88 Pro Grip is a professional light weight glove, which is perfect for matchdays! Select is ready with their latest Select glove on the glove market, and what a glove they have made for us. The new Select Pro 88 Pro Grip is more than just a new colour, the glove also features new technologies, which is going to make you ready for all kinds of weather. Let’s start with the colour. The select 88 Pro Grip comes with a bold white and blue combo, where the back hand is split between the colours, while the palm is made in complete white. The splattered blue design gives the glove a fresh look, while the white base gives the 88 Pro Grip a nice sleek look. The iconic Select logo is placed on the backhand and the glove number, in tis case ‘88’, is moved to the little finger. Moving on to the techs of the glove and trust me Select has added a lot of cool stuff to this glove. The Select 88 Pro Grip is made with a Negative cut, meaning that the stiches on the fingers are placed on the inside, which gives a nice snug fit and improves the ball contact. The palm is made with a new 3 mm Nova Grip latex and is a latex that guarantees a perfect grip in all kinds of weather. This will surely let you dominate the box any time of the year. While we’re at the fingers, Select has added a wrap on the thumb, that starts at the palm and goes on to the backhand. This creates more latex-to-ball contact ensuring you an enhanced catching security. Select has added a Punch Zone in a non-sliding material on the back. This will increase the force in your punches, when you clear the ball out of the area, and also give a reduction of the rotary effect of the ball. The glove is much more than a glove made to work in all kinds of weather, while offering a great grip. The Select 88 Pro Grip also has an inner airprene material, and this will provide a great comfort, increased flexibility and ensuring a minimal water absorption. This means it’s over with heavy gloves, that has absorbed an entire swimming pool during rainy days. To secure that you get a nice and tight grip a neoprene elastic strap is added, while a pull tab makes it easier for you to get the gloves on. Are you up for trying out some new gloves, then the Select 88 Pro Grip is the way to go. Select has proven themselves to be up with the very best, when it comes to gloves. If you are interested in the gloves, then they are available at Unisport right now!